Honduras On The Brink: Curfew Enforced By Military, Opposition Calls For New Election : The Two-Way After a week since Honduran elections took place, the Central American country remains in limbo. The disputed elections led to mass protests against the current president. A masked supporter of candidate Salvador Nasralla yells at fellow protesters to fight police at their roadblock to protest what they call electoral fraud in Tegucigalpa, Honduras on Friday. Honduras is in a state of hostile uncertainty, where ambiguity regarding the outcome of elections has led to deadly confrontations with state forces. On Saturday, The Associated Press reported that the main opposition candidate Salvador Nasralla called for the presidential elections to be held again.
" 'I have asked them to repeat the elections, but only those for the presidency, with the aim of resolving the crisis that Honduras is suffering,' Nasralla told The Associated Press. But he said the new election 'would be under the supervision of an international electoral tribunal, not the local one, because there aren't sufficient conditions to guarantee' the vote would be fair." Supporters of Nasralla, who represents the Opposition Alliance Against the Dictatorship coalition, took to the streets in response to the contested election, saying the voting results were manipulated in order for current, U.S.-friendly President Juan Orlando Hernandez to remain in power. The government announced on Friday that a curfew will be in effect for 10 days, from 6 p.m. to 6 a.m. Regardless of the military-enforced curfew, messages circulating through social media called for a mass demonstration to take place on Saturday night. 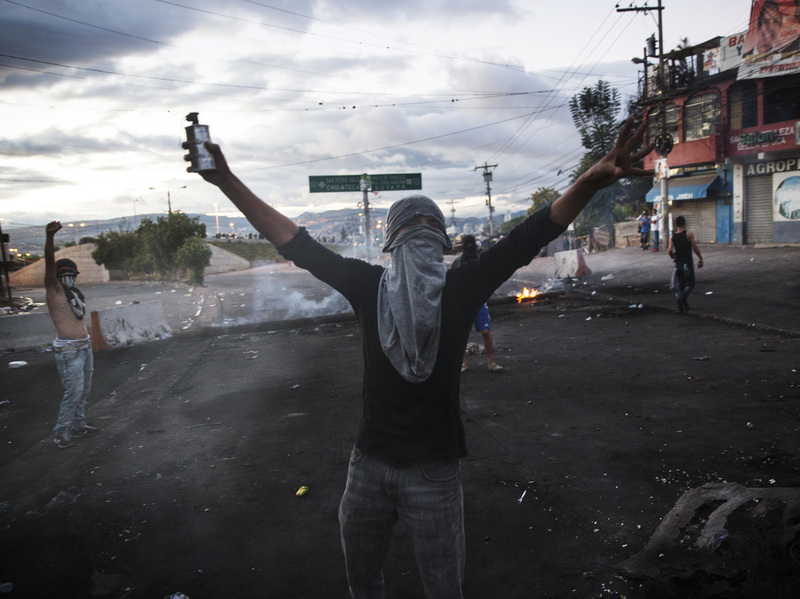 In the early hours of Saturday morning, protests in Tegucigalpa — the country's capital — turned deadly, when 19-year-old Kimberly Dayana Fonseca was shot and killed as troops opened fire on unarmed protesters, The Guardian reported. 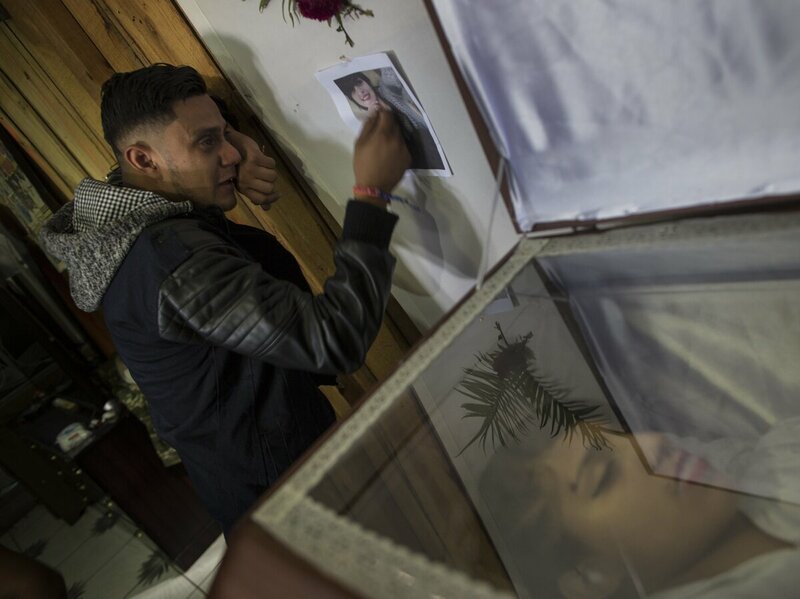 Rudy Fonseca, 29, cries next to the coffin containing the remains of his sister Kimberly Dayana Fonseca, 19, in Tegucigalpa, Honduras on Saturday. She was shot by gunmen who witnesses say were police. Honduras is one of the most violent countries in the Western Hemisphere, where gang and drug violence make it hold one of the world's highest murder rates. 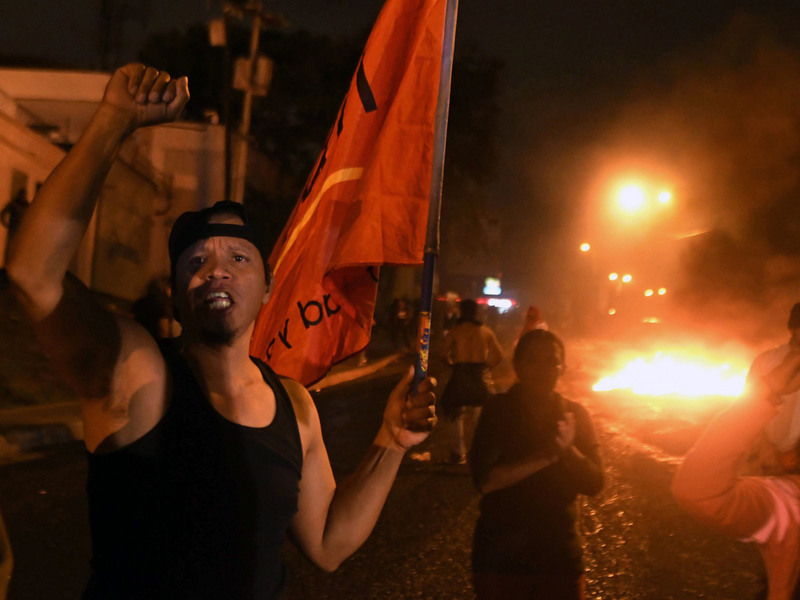 The past week in Honduras has been a turbulent roller coaster, where the disputed election results have further shoved the country towards a crumbling ledge. President Hernandez, who represents the right-wing National Party, had been running for a second term. A report from the Carnegie Endowment for International Peace earlier this year criticized the president's efforts to consolidate the Honduran government under his party, and the website The Intercept recently reported on Hernandez's alleged links to drug trafficking. However, after taking office in early 2014, Hernandez's tough anti-crime push won support among many Hondurans. Nasralla, a former sportscaster, challenged Hernandez by running on a platform of fighting corruption under an alliance of various center-left and left-wing parties. Prior to the elections held last Sunday, rumblings of electoral fraud had been spreading. A day earlier, The Economist released a report on an obtained recording, where alleged members of Hernandez's National Party could be heard planning to rig the election. The magazine did not confirm the recording's authenticity. Almost 10 hours passed after voting ended before the electoral commission — run by members of the incumbent's National Party — released any information, The New York Times reported. On Monday, Nasralla had taken the lead, with 57 percent of the votes counted by the commission. The opposition candidate had 45 percent of the vote, a 5-point lead to Hernandez's 40 percent. Nasralla declared himself the winner. But the electoral commission then stalled, failing to release information as the country waited anxiously for the rest of the results to come in. This prompted European Union election observers to place pressure on officials for a quicker release of information. Counting resumed on Tuesday afternoon, but the gap began to close. Both Nasralla and Hernandez signed an Organization of American States agreement, where they agreed to accept the commission's results. Supporters of Honduran presidential candidate Salvador Nasralla clash with soldiers and riot police near the Electoral Supreme Court (TSE) on Thursday. Then, as the AP reports, the electoral court's computer systems allegedly failed, forcing the country to wait even longer for the results. Nasralla backtracked on the OAS agreement, saying the National Party commission's irregularities were proof of electoral fraud. When the court's system returned, President Hernandez was shown to be winning by a small margin. Nasralla called for his supporters to take to the streets and protest against Hernandez, calling the election process a "cheating system." On Sunday morning, the commission's website showed the president still holding a lead. "The Embassy of the United States of America reiterates its call for all Hondurans to refrain from violence while the result of the November 26 presidential election remain pending," tweeted Heide Fulton, the U.S. chargé d'affaires in Honduras. 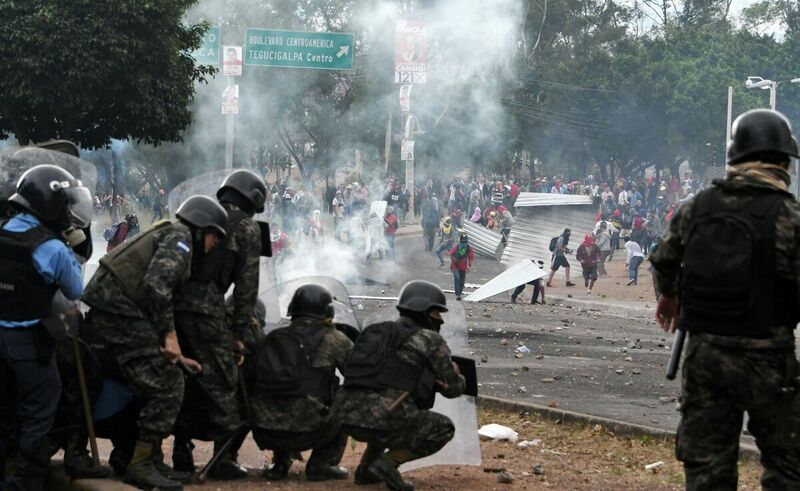 "Public gatherings should remain peaceful, as required by Honduran law." Nando Destephen, a Honduran journalist living in Tegucigalpa, spoke with NPR and said protesters had blocked off the road on which the election court sits. "There is a generation of youth that does not accept it anymore," Destephen said. "At the protests I've been to, the line of police is about a meter away, [protesters] throw stones at them, intimidate them, call on those who run away to continue, I saw them throw a molotov cocktail at the police." The situation conjures memories of the Honduran political crisis from 2009, where a coup d'etat overthrew President Manuel Zelaya. The current leader of the opposition, Nasralla, has Zelaya's support. "People have a little bit of fear, and have some tension, because they are reliving 2009," Destephen says. "They are reliving the entire crisis from the coup of 2009, and the majority of people don't really like that because it brings back some ugly memories." Supporters of Salvador Nasralla set a barricade alight during a protest outside the Electoral Supreme Court (TSE), to demand the announcement of the election final results in Tegucigalpa on Thursday. Zelaya was ousted in 2009 after proposing a nonbinding referendum on the issue of presidential re-election. Military leaders removed Zelaya from office, fearing he would attempt to consolidate power with the referendum. Coup supporters also accused Zelaya of becoming too close to the left-wing leadership in Venezuela. The U.S. State Department, under the direction of Secretary Hillary Clinton, originally said it did not support the coup. But later, it was revealed that the U.S. further strategized to legitimize Zelaya's removal, ushering memories of past CIA-backed coups in Latin America. Months later, Porfirio Lobo from the National Party assumed office in elections held by the de facto, coup government. Under Lobo, violence and corruption in Honduras increased dramatically, as NPR's Carrie Kahn reported, with the United Nations declaring it to be the most violent country in the world. And as NPR reported in 2012, violence at the hands of police was not uncommon. In 2013, a contested election brought current President Hernandez to power. During his presidency, Hernandez attempted to consolidate power, placing allies on the Supreme Court, as the Carnegie Endowment notes. In an ironic twist in 2015, the Supreme Court got rid of the constitution's term limits, an accusation leveled against Zelaya when he was ousted in 2009. The court's decision allowed Hernandez run for re-election. According to a report by Reuters, many believe Zelaya is the "true force behind the coalition" Nasralla is running under. Last week, the opposition candidate said he would review the U.S. troop presence at a military base in the country. Last year, the Inter-American Commission on Human Rights said Honduras suffers from a "prevailing cycle of impunity." The U.S. continues to send money to the country. The 2016 death of activist Berta Caceres symbolized a culmination of the country's violence, from which many thousands of migrants continue to leave — bound for the U.S.
Jose Olivares is a Digital News intern.